Dragan Holcer was legendary Croatian defender, one of the best if not the best ever defender from Eastern Europe. Holcer was born 19 January of 1945. in Zwiesel, near Berlin, Germany. In Nis came from a fascist concentration camp barracks near Berlin, where he was born. His father was killed in a partisan, a pregnant mother found herself in the camp. When the war ended with the mother he returns to Nis. He was a versatile athlete as a kid, but less interested he was in football. The best results were achieved in handball, playing in the attack and scoring goals. It was the love of his sport's biggest. And then, really by chance, he heard that on the playground Radnički Niš gathers about thirty young people to try out for admission to the club. He went to see that. "But they invited him to play. In the end they had received only two boys - one was Dragan Holcer. As center back in the half line first appeared in the cup match against Srem from Sremska Mitrovica, which is set to play a "defender" against a great striker Srem Ganić. He was 18 years and stabilized in the first team. During three seasons Holcer was one of the best players in the Radnički and more increased as an outstanding defensive player. Medium height, ideally built for football, athletics developed, agile and with prompt start, playing a great with head, very combative and committed, quickly he won the fans, both in Nis, where he excelled, and later in Split where he was been celebrated. In the jersey Radnički Niš Holcer played 173 games and reached the best selection of Yugoslavia. In the Yugoslav team debuted in 19th September 1965. against Luxembourg, and played all the mid-1974th year. He played in total 52 matches. In this period the 1968th became vice champion of Europe after the defeat of the Italians. 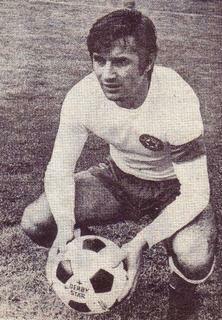 For Hajduk he played 419 matches, from that 311 league matches and scored 9 goals. He was true leader of any team where he played, in every match he gives 100% from themselves. Holcer was very elegant player always cold and secure in his play. He had amazing anticipation and sense for positioning in defence, where he always was one step ahead of any opponents on the field. His prudence in his play delights everybody who watched him on the field. For him never existed "small" and "big" matches, because he always played with full energy, enjoying the game and with all his heart, never acknowledging that is defeated. Realistically assessing his own capabilities, with certain technical problems in the beginning of his career all that he had compensated by big heart and dedication that was used for example. One of the legendary captains who gave the most to Hajduk Split, he came when the club was in the lowest point ever in former country, and captained it when the club became one of the best teams in the world.